WildFlowers Australia receives all sorts of requests for help and information about wildflowers. In this section, we list some commonly asked questions and answer them, in the hope that others will also find this information useful. What is actually meant by the term 'wildflowers'? The term “wildflowers” in its broadest sense, refers to flowers and foliage native to Australia and South Africa, sometimes also called ‘hard flowers’. A more narrow definition is flowers and foliage from species endemic to Australia. Australian wildflower species grown commercially include flannel flowers, Christmas bells and gum blossom, riceflower, Thryptomene, waxflower and Scholtzia, kangaroo paws, grevilleas, banksias and the related waratahs, and the gigantic Gymea lily (also valued for its versatile leaves). 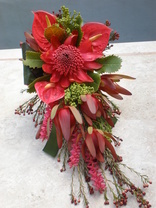 South African species grown in Australia include a wide selection of Protea species, many types of Leucospermum (commonly known as pin cushions), Leucadendrons and the dainty Serruria (or blushing bride). In addition, a very wide range of foliage is sourced from Australian and South African species, to complement the flowers in arrangements. The industry is strongly aligned with the ‘fashion’ and ‘lifestyle’ sector where demand can change quickly. Our industry has a good reputation for innovative products and improved varieties, and there are many as yet unexploited opportunities to develop even more new and exciting products. Native Australian and South African plants are ‘newly domesticated’ species and there is still a great deal to learn about their breeding, propagation and production systems. Many are woody species which do not attain marketable yields for some three to five years. This is a long lead time, compared to many traditional flower species, like roses, gerberas and bulb crops like lilies. Provided they are handled with care and given the right post harvest treatments by growers, marketers, florists and end consumers, fresh cut wildflowers have a comparatively long vase life compared to many traditional flowers. Where can I buy wildflowers? Depending on where you live, there are a number of options. Most florists carry some wildflowers in stock and may be able to source specific flowers for a special occasion, like a wedding, from their normal suppliers. Florists may order their flowers through a flower wholesaler or buy direct from growers, and/or they may visit large wholesale flower markets where several wholesalers, or a number of growers, offer a wide range of flowers and foliage for sale, including wildflowers. Some wholesale markets, such as the Sydney Flower Market at Flemington and the Brisbane Flower Market at Rocklea, are public markets, meaning that anyone can visit them to buy their fresh flowers. Check your local Yellow Pages to locate them. 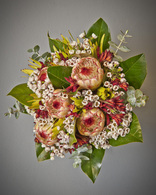 Some florists specialise in wildflower arrangements, or like to combine them with traditional flowers in their designs. Again, look up florists in your local Yellow Pages to find them. Please don't be tempted to go into the bush to pick wildflowers. In many areas, wildflowers are protected species and you can be fined for picking them. It isn't worth getting caught and the flowers may not last anyway because they have not been properly conditioned. In general flowers and foliage from cultivated plants will be of better quality and have a much longer vase life than stems broken off a plant in the wild. Keep your flower bunch or arrangement cool and out of the sun and take it home as soon as possible. Never leave fresh flowers in a hot car. Recut the stem ends neatly with sharp secateurs, removing the bottom 3 cm. Prepare your vase or container: make sure it is clean. Add fresh clean water or water with added flower food (as supplied by your florist and made up according to the directions). Check every day, as your flowers can use a lot of water. If cut-flower food is not used, change the water at least every second day. Do not display your flowers in areas that are exposed to full sun, draughts or high temperatures. Keep as cool as possible without freezing. As individual flowers wither and reach the end of their life, remove them from the vase and discard. Note: Some wildflowers dry very well and can be used in dried arrangements. I'm interested in exporting flowers - what do I need to know? 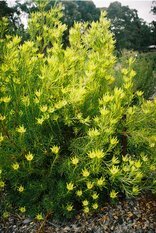 How can I find out which wildflowers are in season? Many wildflowers are seasonal. While some are available for several months of the year, others have a very short flowering season. Flowering times will vary from year to year, depending on seasonal conditions and the geographical location of the grower. Go to the 'Wildflowers by season' entry on the main menu.